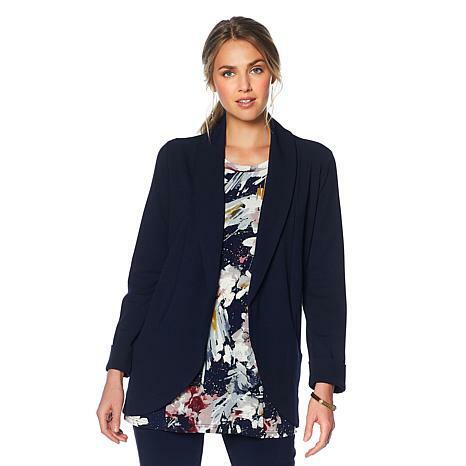 Every lady needs a basic classy blazer and this is it! I ordered navy in size large (my regular size) and it fits perfectly. I absolutely love the weight of the material as it hangs nicely and doesn't show any curves. Very pleased with the design and quality. Highly recommend. First, I love the cut. It hangs perfectly and the sleeves are not too long on me, a usual issue. I love the curved hem in front and the hidden pockets that are in seam. Most of all I love the fabric. Substantial but not hot or lined, which I need for Texas. Had to send back as it was too bigeven though I ordered the extra small. The blazer was really of good quality though. This blazer runs large. I normally wear a medium, but the medium was way too big. LYSSE Faux Leather Classic Moto Jacket - Plus LYSSE is a fashion line that's crafted for all women. With fabrics and design elements that stretch and offer flattering angles, every woman finds a balance being chic and comfortable. Black faux leather sleeves bring a rock 'n' roll edge to this military-inspired trench. The twill outer is fashioned with an exposed zipper and a column of functional buttons, while the belted back achieves a more-fitted look.